Has it really been 2 months since my last blog post ?!?! Wow, time flies. Doesn’t it? 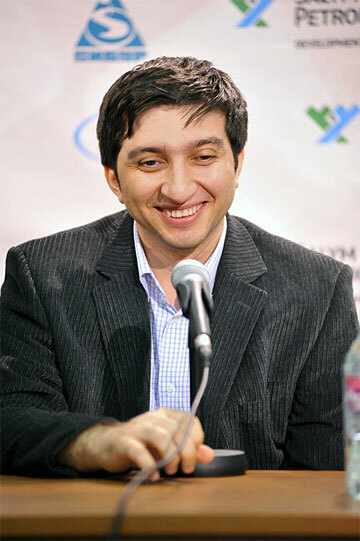 In memory and honor of this wonderful being, the Gashimov Memorial tournament was born, and held over a span of 10 days in Shamkir, Azerbajain, with the last round just finishing yesterday. As expected, Carlsen won, adding yet another feather to his cap. He’s got so many feathers now, that he can strut around like a peacock 😀 . Can anyone remember the last time Carlsen DIDN’T win a major high-level tournament? That’s pure dominance right there. Things were looking great for him at this stage. After an exciting draw against Karjakin, which was an “Almost-won, Almost-Lost” for both players, Carlsen faced Caruana with Black once again. It started out as a Berlin, which of course bored everyone to death 🙂 . But things began to pick up on the 20th move. Caruana was enjoying a nice space advantage, and some inaccuracies from Carlsen further added to Caruana’s bonus. A tactical error by Magnus on the 24th move, sealed the deal, and from there on Caruana slowly but surely converted his material and positional advantage. This must have been a hard blow for Carlsen. After playing great chess for 3 rounds, he lost in a rather one-sided battle. But no matter, he had the White pieces now, and was Angry. His 5th round against Radjabov started out as a Kings Indian, with Carlsen choosing a line rarely seen at the top level. Radjabov lashed out with 19.f5, a typical Kings Indian move, undeterred by the fact that his King was somewhat exposed on h7. An erroneous capture in the center with 22.Nxe4 by Magnus, saw him lose an exchange by force. He definitely had some compensation, but Radjabov was able to induce some weaknesses, after which Carlsen’s positional crumbled and he was forced to resign. Yes, Resign! So what was it that led to such a spectacular turn around ? Mental Strength and Determination. Magnus writes “The rest day with the exciting football cup was just what I needed. Our team of international players, with help from two Azeri players in the final, won on penalty shoot out. I’m feeling more energetic, and although my play isn’t perfect, the results have been terrific after the rest day.” So for him, it was watching his favorite soccer team that relaxed him and helped him to forget the agony of the previous 2 rounds. Whatever your thing is that helps you relax and put aside painful losses, it’s important to do that immediately. It builds Mental Strength, and the Will to keep fighting. That’s what makes a Champion! I have just been introduced to you by two very nice articles in chess base. Congratulations on you fine achievement, and good luck in your quest. I hope to be reading great things about you in the future and will certainly be rooting for you too! John, thanks for your kind words and good wishes. Best wishes to you too.